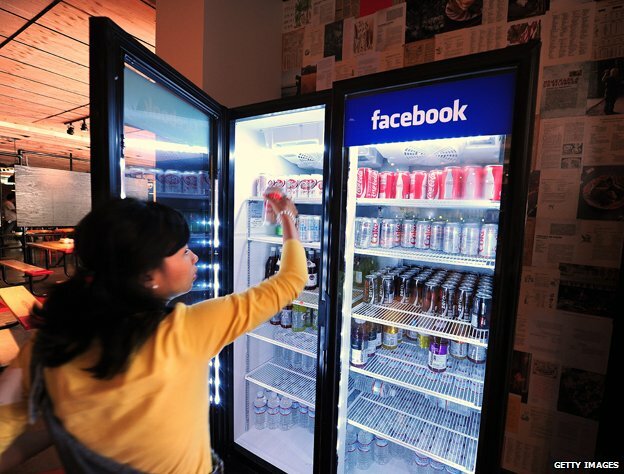 Home > Does free food make for a happier office? Free meals, coffee, tea, and even alcohol are being offered by some companies in an effort to make their workers happier. But does it work? One of the biggest cliches in business is that there's no such thing as a free lunch. But this is fast becoming untrue in more and more workplaces. City firms and large technology companies including Facebook and Google are the most generous providers. Their canteens are filled with hot meals, desserts and drinks at no cost to staff. Google is rumoured to have a "150-feet" rule, stipulating that no worker should be further than this distance from a food outlet. It is apparently very generous, the kind of thing most workers would love, rather than having to spend hundreds of pounds a year on sandwiches. But what do companies get in return? They say it improves morale, that being well-fed and watered provokes a sense of wellbeing. Dan Cobley, Google UK and Ireland's managing director, has said queues for the canteen are purposefully kept above a certain length to encourage "serendipitous interaction" among staff, hopefully leading to creative discussions. "Google, in particular, provides everything and that's designed to keep you there, not just at your desk, but at work," says Sandi Mann, senior psychology lecturer at the University of Central Lancashire. "At the extreme it makes you feel you need never go home. It's a perk and people feel they want it. But it's not a good thing if it means you haven't got a life outside." Still, it's free, even if the company has to recoup the costs somewhere. "It's the principle of reciprocity," says Mann. "If someone does something for you and you feel obliged to do something back. It's the same principle that marketing people use when they give you free samples." In 2011 Ben Driscoe, a Google employee, started living in his car at the company's California offices, managing to survive for 60 weeks on the perks offered. He received advice from a Living At Google website set up by another employee: "The only thing they don't give you is shampoo." The Entrepreneur.com website recommends companies serve staff free continental breakfasts "once or twice a week". "Bagels, muffins, coffee and similar fare make for a nice way to start the day," it says. It's also pretty cheap, with UK supermarkets selling bags of eight croissants for less than £2 - very little compared with a firm's overall costs. At the east London office of the advertising and creative firm Albion, Friday afternoons are even more popular than usual. Work tends to stop early at the boss's behest. At 4.30pm a mock-up bar opens up, wine, beer and cocktails. The receptionists are described as "good mixologists". "We've always thought that 'little extra something' gives our people a thank you from the business every day," says chief executive and founder Jason Goodman. "Friday night bar is a ritual at Albion. It's the signal that calls in the weekend and makes sure people stop work at a reasonable time and can wind down with each other before heading off for their weekend. It's our equivalent of family time and enjoyed by all." US psychologist Abraham Maslow described a "hierarchy of needs" for human beings. The most basic are physiological - including food and shelter - and a feeling of safety. If these are taken care of, employees can move on to the next stages - feeling socially accepted and gaining a sense of self-esteem. Once freed of such ordinary human concerns, Maslow argued, they can progress to "self-actualisation" - a full-on commitment to their work which leaves them feeling fulfilled. Meals - and even cocktails - can serve part of this vocational journey. Free beer, hot meals, climbing walls, bus rides, smoothies, and even computer games are also popping up as bosses look for novel ways of keeping morale high. Taxidermy lessons were bought for a member of staff at the7stars media agency, in central London. "Discovery dosh" is given to foster creativity "outside their comfort zone". A more conventional freebie in many offices is tea or coffee. "Initially it makes people turn up for a meeting and not be late," says Pamela Yeow, senior lecturer in management at the University of Kent. "It works for some time, but actually to motivate people in the longer term they need to feel they actually want to do their job." She thinks perks are more effective if they don't become routine. "If it's unpredictable and people are told it's because you've had a fantastic month, it's a lot better," Yeow says. "It shows you realise people are working hard and you want to reward them." 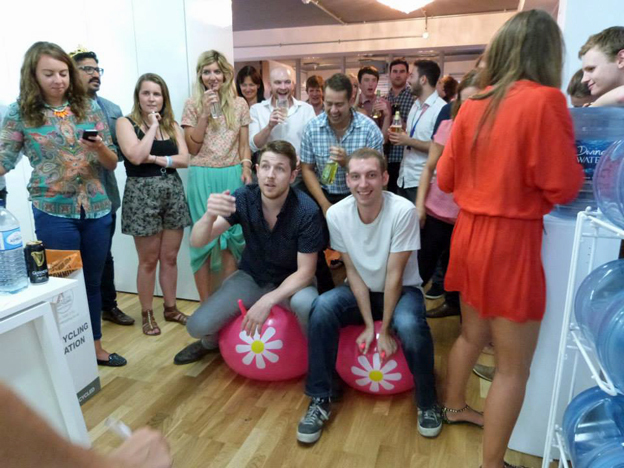 Some firms, including Admiral Insurance, ranked second among the UK's best large employers by the Sunday Times, offer pool and table tennis as a means of relaxation. But, away from this largesse at financial and technology firms, many workers in less rarefied businesses are reporting cuts to traditional perks, such as free Christmas meals or subsidised canteens, according to the Trades Union Congress. Earlier this year, staff at Asda started a petition in protest at plans to close up to 200 canteens. In 2011, Derbyshire Police did the same at its two main stations, as the force looked to save £170,000. "Some companies and organisations offer free food to their staff," says TUC general secretary Frances O'Grady. 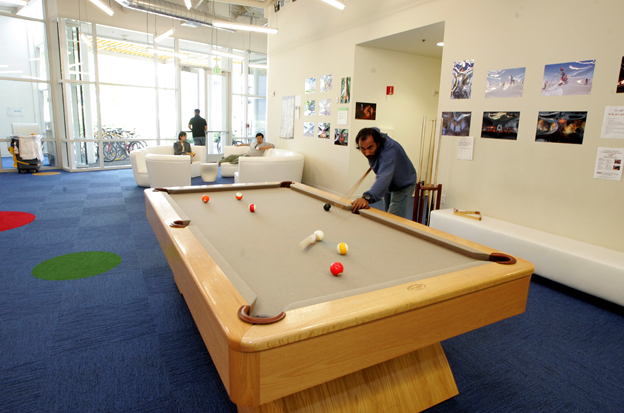 "This is often valued by their employees, as long as they can take a proper break away from their workstations. While the idea of working from home has failed to kill the office, workplaces have started to look much more like homes, writes Lucy Kellaway. 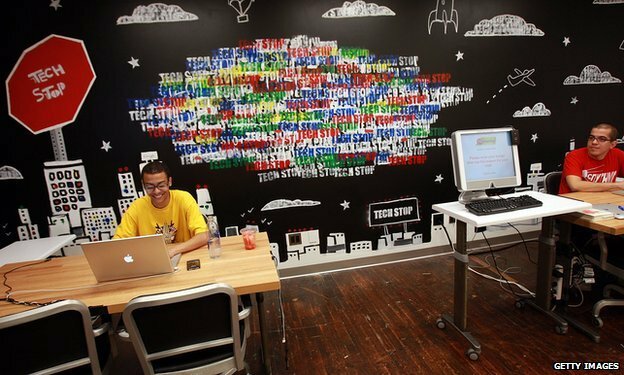 Companies, particularly in the creative or tech industries, are ploughing money and energy into designing offices that look more like adult playgrounds than a place of work. 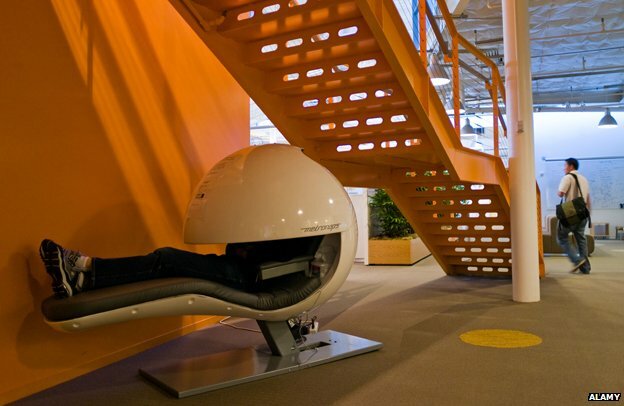 Kate Magee gives a round-up of 10 bizarre objects found in "cool" offices. "But this is rather the exception at the moment. Pay and benefits have generally been squeezed in recent years in both the public and private sector, and nobody will be impressed by a free lunch or a box of chocolates for Christmas if they have not had a decent pay rise." Is there a way to make the apparently growing differences between the treatment of staff at different companies and organisations easier to bear? "Employers sometimes focus on the cost of things too much", says Mann, "when the really important thing is staff feel they are acknowledged and praised when they do good work. There's research to show that even your boss smiling at you can be motivating. Lots of bosses don't, actually."